Unlike certain other visitors to your town, I know when to give up. I paid for my parking space for the date in question, as the enclosed receipt clearly shows. I was in town so my son could visit Gettysburg College, we stayed at the Gettysburg Hotel. I paid for parking late in the evening, the ticket says it was good for 24 hours, I retrieved the car just over 12 hours after parking, I never moved it during the night. I returned the original ticket with an explanation and the original receipt to your parking authority. A few weeks later I received a summons. Believing (forlornly hoping is more accurate) that everything crossed in the mail, I ignored the summons. I received a second summons earlier this week. I note that to plead not guilty will cost me $58.00 and I would be required at some point to drive the five and one half hours down to Gettysburg to appear in your court and pleasantly point all this out in person. While I love Gettysburg and would really love to have someone acknowledge that fact that I did indeed do exactly what the hotel told me to do in paying for parking and “whatever you do, don’t move the car before you leave” that’s too much of a time commitment to save $12.00. I am not pleading guilty, because (a) it’s over a $10 parking ticket; (b) I’m not. However, while I feel I have been ‘Dan Sicklesed’, I’m sure my $70.64 would do some good for a great town, so please accept my payment. 150 years ago today Lincoln gave the Gettysburg Address. The speech, about 270 words long (there are 5 versions, no one is really sure which one he gave) speaks for itself, and will forever do so. I’ve been reading articles for weeks leading up to this day, most are arcane discussions of exactly where and how Lincoln wrote it; even more insufferably, exactly where he stood when he gave his two minute speech (some scholar spent years analyzing the photographs from the dedication of the National Cemetery on Cemetery Ridge and, in a five page article, explains that Lincoln was definitely 40 or so yards away from the spot marked at Gettysburg). Maybe it’s our stat driven, fantasy baseball/football, trivia obsessed, re-enactor driven, ‘where, exactly, was my great-great-great grandfather’s regiment’, mentality but it seems that we are in a period of studying trees at the expense of even noticing the forest. Lincoln was a last minute invite to the dedication, he sat through a two hour oration by the featured speaker, Edward Everett – who had asked for, and received – months of preparation. 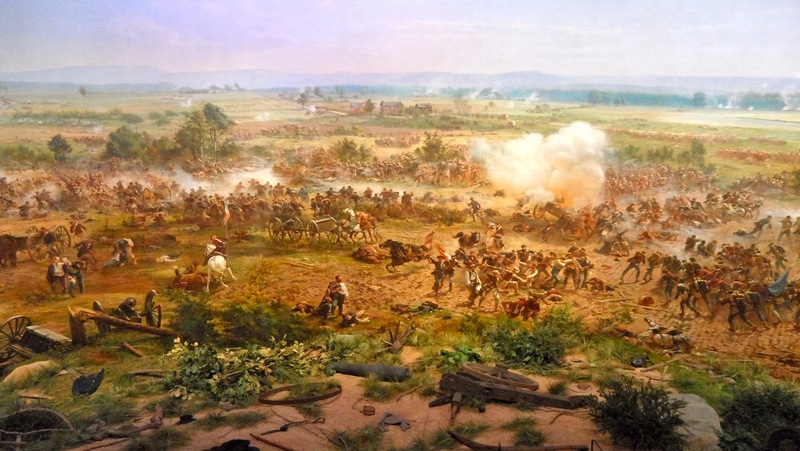 He was surrounded by fresh graves, men were still dying from their wounds in the hospitals around Washington, the townspeople of Gettysburg had only recently been relieved of the lingering stench of decomposition that had hung over them since July. . . and in roughly two minutes Lincoln made sense of it all. For then and now. The words were and are what count. I memorized them when I was thirteen, there was a school wide competition, the finalists addressed an open soccer field, a group of teacher/judges stood alone at midfield. A girl won, she had nailed the emotion while the boys yelled out the words. As Ken Burns shows in his new documentary, the words are tough to memorize, but they stay with you and take on greater and greater meaning as one ages, experiences, empathizes. They do not lend themselves to trivia. Yesterday won’t be over until tomorrow and tomorrow began ten thousand years ago. For every Southern boy fourteen years old, not once but whenever he wants it, there is the instant when it’s still not yet two o‘clock on that July afternoon in 1863, the brigades are in position behind the rail fence, the guns are laid and ready in the woods and the furled flags are already loosened to break out and Pickett himself with his long oiled ringlets and his hat in one hand probably and his sword in the other looking up the hill waiting for Longstreet to give the word and it’s all in the balance, it hasn’t happened yet, it hasn’t even begun yet, it not only hasn’t begun yet but there is still time for it not to begin against that position and those circumstances which made more men than Garnett and Kemper and Armistead and Wilcox look grave yet it’s going to begin, we all know that, we have come too far with too much at stake and that moment doesn’t need even a fourteen-year-old boy to think This time. Maybe this time with all this much to lose and all this much to gain: Pennsylvania, Maryland, the world, the golden dome of Washington itself to crown with desperate and unbelievable victory the desperate gamble, the cast made two years ago; or to anyone who ever sailed a skiff under a quilt sail, the moment in 1492 when somebody thought This is it: the absolute edge of no return, to turn back now and make home or sail irrevocably on and either find land or plunge over the world’s roaring rim.